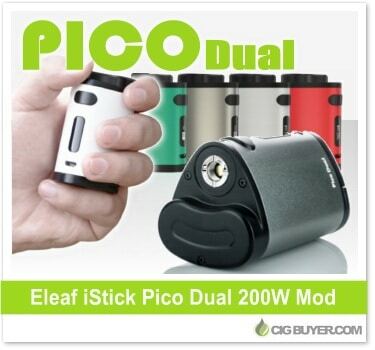 The iStick Pico Mod has gained a lot of fanfare because of it’s compact size and excellent performance, but it has limited battery life and only offers up to 75W of power. Well the new Eleaf iStick Pico Dual Box Mod addresses those issues by housing two 18650 cells and providing up to 200W of output with temperature control (Ni/Ti/SS). It includes revised Buck-Boost technology, updated OLED screen, preheat functionality, 3-memory TCR mode, cell balancing trickle charge and more. Although it’s not as small as the original, the Eleaf Pico Dual Mod is still super compact for a dual battery device.